Do you dare play True Colors? The True Colors board game is a personality-fueled game for teens and adults that may not be for the faint of heart. With gritty questions and honest answers, it has been heralded as both a fun way to spend an evening and a risky way to end friendships. 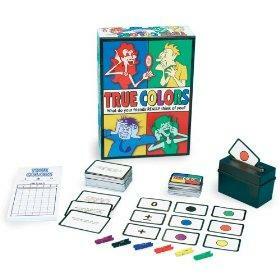 True Colors is made by the Pressman Toy Corporation, and is designed to be played by three to six adults. The game consists mainly of cards with different personality probing questions, such as "Whose room would you most like to redecorate?" or "If you were put into prison, who would be the first to bring you fresh baked cookies?" Some questions are more harmless than others, and all require you to vote on who is likely or unlikely to be the answer. Each player is represented by a colored clothespin (or card in later versions), and to vote you place the color of the player you wish to nominate as the response. For example, if you would like to choose Steve as most likely to get drunk at a party, then you would place the red card into the container, representing Steve. Players can also vote for themselves if they believe they would be the most likely fit, and this is another way to garner points. This game was recently rolled out again after players used a version that could be considered quite vintage. The new questions have come under fire by die hard True Colors enthusiasts, as they have been simplified and lack creativity. Old question example: "When on the dance floor and tripping the light fantastic, who is more 'trip' and less 'fantastic'?" New question example: "This person's, well, not the most coordinated man or woman playing. Who is it?" In short, the questions have been perceived as having less humor and more potential for hurt feelings by those who have played both versions. Like most classic games, the new version of the True Colors board game is also made more simply and economically, with smaller clothespins and game pieces of lesser quality. On the other hand, many players enjoy the new plastic tray and voting container that make the game a bit easier. Many have credited the True Colors board game as bringing tension to an otherwise laid back game night, and the Internet is littered with articles and blog posts paying homage to an innocent game gone horrendously wrong. For this reason, it is not recommended you play True Colors with someone who is very sensitive and unable to take constructive criticism. Those who are very conscientious about what others think of them will not enjoy this game, likely taking it simply as a hard knock rather than a playful joke. Others have also been accused of cheating and/or slanting the results of the game by voting excessively for them or another person in order to tweak the final results. This can also backfire if a person feels emotionally wounded about a result determined about him or her, even if the votes were still false to manipulate the game. In short, do not play this game with people who will just plain take offense - which shouldn't be difficult as you must play it with people you know very well in order to progress properly. This is not a game for strangers or friendships that are already strained. Save it for family or your best friends on a lazy, laid back night. True Colors can be purchased at Toys R Us and Drugstore.com.